Women priests are visible reminders that women are equal images of God, and that is one of the reasons for ordaining women in the Catholic Church. A major problem with patriarchal religion is that it professes that God is neither male nor female, but uses images and words that are exclusively male to refer to God and teaches that only males can "represent" God in worship and in positions of authority. It is time to encounter God beyond all names and images and explore God's feminine face in our prayer and worship. The Feminine face of God is revealed in the bible and in Christian tradition. "As we approach the 50th anniversary of the opening of the Second Vatican Council (Oct. 11, 1962), we should highlight some of the structural changes in the Catholic Church that were supported by the Council but undermined or ignored, especially by Pope John Paul II and currently by Pope Benedict XVI. One structural change called for collegiality, which would have had profound implications for accountability and transparency, both of which are needed in the Vatican and in the Church at large. Collegiality means that all the bishops as a collective have a role in Church governance as a matter of divine law and in a way that makes them a counterpart to the centralism that has prevailed in the Church for more than a millennium.. . . Likewise, discussion of the ordination of women is disallowed despite the fact that women presided at Eucharistic celebrations in the early Church and no valid scriptural or theological reasons exist which would prevent the ordination of women today. . . . Instead, Catholics are deprived of priests and full Eucharistic liturgies. Precious Catholic liberties are stolen from them not by secular governments but by the Vatican and its accomplices..."
"The American Catholic bishops, charging that religious liberty is under attack, have proposed that the two-week period from June 21 to July 4 be dedicated to a Fortnight of Freedom, emphasizing prayer, education and public action. Their summons seems hypocritical, however, when it is evident that they ignore the sensus fidei or sense of the faith professed by the People of God (Lumen Gentium 35) and trample on the rights of conscience of those who disagree with them. When they speak of religious liberty one may well ask: Religious liberty for whom? The bishops? Or all the Catholic people?" KANSAS CITY, Mo. -- "A priest who has spent almost two decades in jail for acts of nonviolent protest against the country's nuclear weapons complex faces another possible year and a half in prison after his actions on Wednesday. Fr. Carl Kabat, a 78-year-old member of the Missionary Oblates of Mary Immaculate, faces three criminal charges after cutting through a fence and entering the grounds of the Kansas City Plant, a major new nuclear weapons facility under construction, to call attention to its building. Kabat's action represents the latest in a years-long campaign by activists to call attention to the facility's construction. Protests at the site, which is estimated to cost $1.2 billion and scheduled to be partially operational by early 2013, have been led in part by area Catholics who have also been leading petition campaigns to remove funding from the site. One of the petitions, focused on developing a plan for reuse of the facility should it be abandoned in light of weapons cuts, was unanimously passed by the local city council in March. Kabat told NCR after his release Thursday that he first entered the property of the Kansas City complex Tuesday, using bolt cutters to make a hole in a perimeter fence and walking through. Kabat said he then spent Tuesday night on the grounds of the complex until he was found and arrested Wednesday morning. In an email Wednesday explaining Kabat's action, Chrissy Kirchhoefer, a member of the St. Louis Catholic Worker community who regularly assists the aging Kabat with travel and other needs, said the priest's intent was to celebrate "Interdependence day" by "cutting as much of the fence perimeter" of the Kansas City plant as possible to "allow all of the Holy One's deer and other animals that once used the former bean field for its habitat" to come into the area..."
Feminist theologian Mary Hunt does not pull any punches in her analysis of the impact of the "Nuns on the Bus" on the social and political agenda of our nation. Neither do the nuns on the bus! Their message reflects Matthew 25 and clearly places protecting poor and marginalized people as an agenda of compassion that impacts people of all faiths and no faith. The nuns agenda of justice and freedom for all, not just the bishops, is becoming an important election issue. Well- done, Sisters! You have shone a bright light on immoral budgets like the one proposed by Rep. Paul Ryan. No wonder the lobbyists with big money and powerful names are running for cover. Let's hope that your prophetic witness to Catholic social justice issues will be a top priority of U.S. voters too, and that they will elect responsible public officials who will legislate for the common good, instead of giving more tax cuts to billionaires, who are unwilling in many cases, to pay their fair share. We cannot afford spiritually to balance our budget on the backs of the poor. The nuns on the bus have left the bishops' in the dust with their fizzling 'fortnight of freedom' out of steam! It goes to show that no multi-million dollar public relations campaign is a match for nuns' prayer power and prophetic witness! Well done, Sisters, and outstanding analysis, Mary Hunt in your article below! 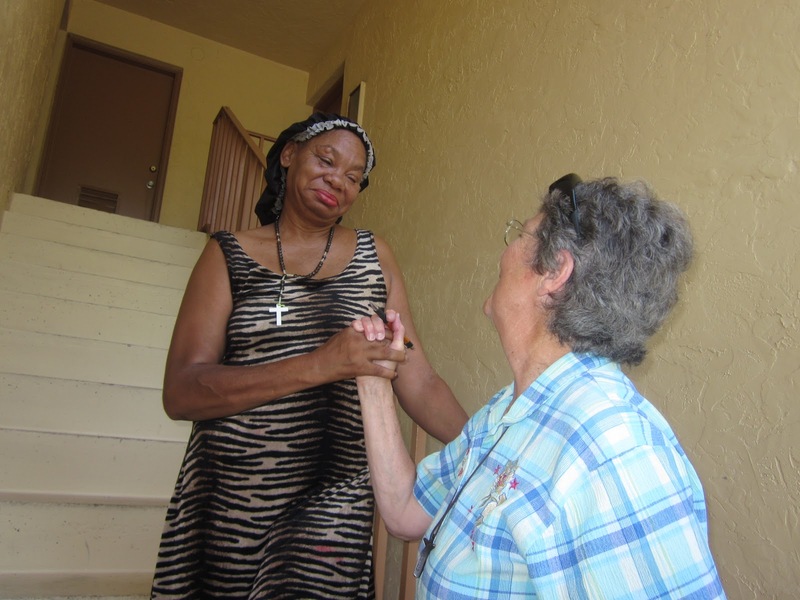 "Tourist buses are fixtures on Capitol Hill, but the arrival at the Methodist Building of “Nuns on the Bus: Nuns Drive for Faith, Family and Fairness” in noonday heat to the cheers of their colleagues had to be a first. Hustled out by handlers like rock stars, the half-dozen nuns (and one woman who was not a nun but joined the trip anyhow) made their way to a flag-backed stage to join other interfaith leaders in prayer and speeches. Sister Simone Campbell, a Sister of Social Service and the Executive Director of NETWORK: A National Catholic Social Justice Lobby the sponsoring organization, appeared flabbergasted and delighted by the hundreds who turned out in the midst of the DC region’s massive power outage to welcome them home. Prophets in their own land—in this case, lobbyists among lobbyists—usually get a mixed reception at best. Fourth of July tourists wondered what was happening, a good question for a broader audience. Why did screaming young Hill staffers, dozens of Muslim women in head scarves, elderly people both men and women, social justice workers, and lobbyists converge to fête a group of women who traveled 2,700 miles through nine states to visit soup kitchens? I am sure the riders will tell the story in full detail once they get their land legs back, and I know video crews accompanied them. So for now, I offer a word of explanation about what I think the trip means in the big picture of religiously influenced social change. And then there's the notable fact that the nuns eclipsed the bishops’ “Fortnight of Freedom” without even mentioning it. Apparently official church efforts are going on all over the country as I write, but enthusiasm has been so low that even the bishops aren’t saying much about it. Even critics have ignored it. So much for a large-scale buy-in to their argument that the government insisting on having insurers offer contraception without a co-pay would eradicate religious liberty as we know and love it. Not even the Vatican’s brand new Opus Dei Fox News communication strategist Greg Burke can spin their way out of this failure. Coming on the heels of the conviction of a Philadelphia priest for enabling sexual predators to continue in ministry, what virtually every other diocese did as well, appetite for the bishops’ ideology is all but gone..."
Let's support religious liberty for women and for all, not just Bishops in the Catholic Church! This is yet another reason we need women priests! "You may have heard that the U.S. Catholic Bishops are trying to force their views about contraception on women and calling it the "religious liberty" of Bishops to do so. But what about the religious liberty of women? 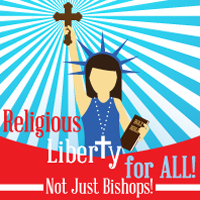 Stand up for women this July 4th and celebrate the fact that the United States promotes religious liberty for everyone, not just bishops. As Catholics, we have a strong history of supporting religious liberty. 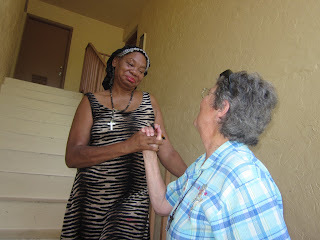 Let's ensure it continues to include women..."
Yesterday was an overwhelming ministry day with some of our women. We were very sad for her as she will be homeless again. Betty age 60, get settled in housing. miracle and she kept thanking God for it! and she will be okay, but what a day for her! to cook a Bar-B-Q feast for the others for the July 4th holiday. to avoid toilets and just "go" and she was once again evicted. but this is truly "all in her head" and she cannot control it. housed although she has her Disability check. 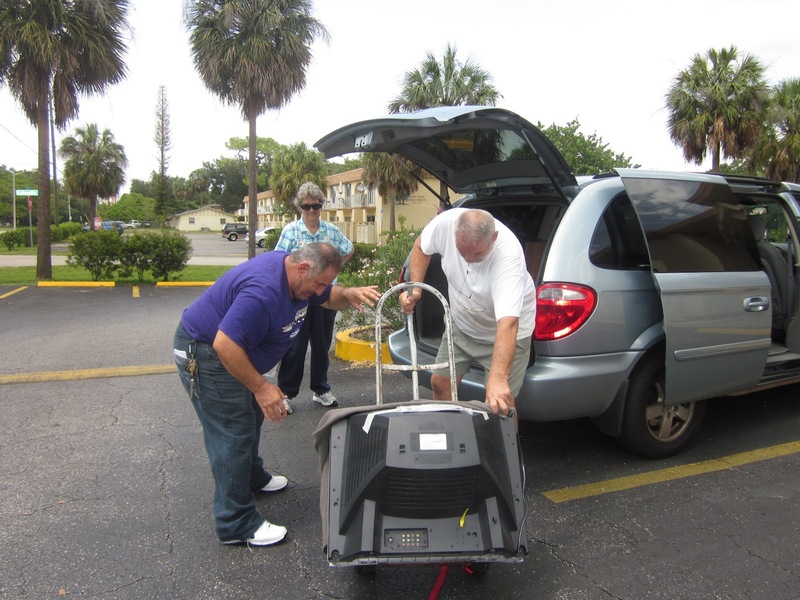 church members to help her clean, but the stench gets her evicted. refuses help as she believes that she is fine. any medical or mental health service there is NONE!! on the doorsteps of St. Francis RC Church for years. perhaps most difficult woman to minister to, oh for a miracle! whom we moved from a condemned trailer to good housing. well in her new place. and as a jewelry maker. "The Vatican scandal over shady bank accounts and millions in suspect transfers began shortly before sunrise on June 5 on Via Giuseppe Verdi, a picturesque street in the old part of Piacenza, a town in northeastern Italy. An elderly gentleman in a tailor-made suit had just left his house with a leather briefcase dangling from his right hand. He was on his way to his car. This scares me and should scare everyone especially Catholics who give money to the church! Money laundering, links to the mafia, what do we have here a crime family or a church devoted to spreading the Gospel of Jesus, which is about sharing and being God's love for all. This story reads like the Da Vinci Code! Only it is real, and it is about the Roman Catholic Church's Vatican Bank! The corruption and lack of accountability is mind-boggling! The The U.S. media needs to step up and cover this story as a major newsworthy event that the public needs to know about. The scandal over leaked documents that has been engulfing the Vatican is the biggest breach of confidence and security at the Holy See in recent memory. Known as Vatileaks, the crisis has shed light on a Vatican gripped by intrigue and power struggles like a Renaissance court. Vatileaks erupted into a full-blown scandal with the publication two weeks ago of a book of Vatican documents alleging corruption and conspiracies among cardinals. Within days, the Vatican bank president was abruptly dismissed and the pope's own butler was arrested on charges of stealing the pope's correspondence. The Vatican denounced the leaking of papal letters as a brutal attack and launched a three-pronged investigation to find the moles. This week, Pope Benedict XVI broke his silence and denounced what he called false media coverage. Gianluigi Nuzzi, the Italian journalist who published the leaked letters, will not reveal his sources. And he's is not at all convinced about Gabriele's guilt. "It's the Vatican press office that announced that many documents were found in the butler's home," Nuzzi says. "Now, if he is the whistle-blower he must be really stupid to hold on to all stuff. And it's very disturbing that the trial will be held in secret." But even if Vatican trials are closed to the public, analyst Politi says, news of the proceedings will leak out and provide further embarrassment for Benedict. "The pope in the last six to seven months has let happen so many scandals about money and [transparency], that now the Roman Curia and Catholic public opinion is in great disarray, everybody asking, 'What's going on?' " Politi says. Mickens, the reporter, says the Vatican is in dire need of structural reforms. "It's a courtlike situation that is staffed and run by people who have no experience growing up in a court," says Mickens. "They're all from democratic societies; it's just not suited for the 21st century; and it is nowhere to be found in the Gospels, or Scriptures — it's a cultural anachronism"